The Responder Safety Learning Network (RSLN) is pleased to announce that, in partnership with the Federal Highway Administration (FHWA), a certificate in traffic incident management is now available on learning.respondersafety.com. 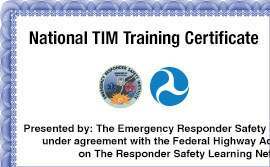 This certificate, earned by taking ten RSLN online training modules, is equivalent to attending the in-person National Traffic Incident Management Training. The training, and the certificate, are free. Registered users who have passed the Skills Challenge test for some or all of these modules prior to the announcement of the availability of the certificate will receive credit for these modules. Therefore, RSLN registered users who have already passed all ten of these modules have already earned the certificate and just need to download it. Now, when registered users sign in, they will see a new area of the User Console on the left side of each page called "National TIM Training Certificate." This area shows that user's progress on earning the certificate. Each block is one program; move your cursor over that block to see the name of the program it corresponds to. Click to view that program. Checked blocks are programs that are successfully completed (meaning the Skills Challenge test has been passed). Unchecked blocks are programs that have not yet been completed. Once all ten programs are complete, click the title "National TIM Training Certificate" to download the certificate from the certificate's main page. You may also download the certificate from the Completed Programs page or from each required program's details page. Once earned, the certificate is listed on your transcript. "ResponderSafety.Com is thrilled to partner with the Federal Highway Administration to make this online certificate available," said Steve Austin, Project Manager. "We already have thousands of users who have taken some or all of the programs that count toward earning the certificate. We expect this web-based National TIM Training Certificate will make our vetted online training an even more attractive option for all first responders who value operating safety when responding to roadway incidents." Earning the National TIM Training Certificate is also part of RSLN's secondary reporting system. Registered RSLN users who opt-in to secondary reporting will have their earned certificate as part of their record visible to training managers at the agencies the user has designated to receive their RSLN training results. "We are very excited about what this new certificate means for the organizations and states that have opted into our secondary reporting system," says Austin. "Training managers at those organizations can log in and verify that their first responders have completed this vital training and earned the National TIM Training Certificate. No more need to print and submit certificates on paper." Get started earning your TIM certificate today by logging into your RSLN account and taking the required programs. Information on the certificate and a list of programs linked to their content is available now. The Federal Highway Administration (FHWA) is an agency within the U.S. Department of Transportation that supports State and local governments in the design, construction, and maintenance of the Nation's highway system (Federal Aid Highway Program) and various federally and tribal owned lands (Federal Lands Highway Program). Through financial and technical assistance to State and local governments, the Federal Highway Administration is responsible for ensuring that America's roads and highways continue to be among the safest and most technologically sound in the world. SHRP 2 (2006-2015) find strategic solutions to three national transportation challenges: improving highway safety, reducing congestion, and improving methods for renewing roads and bridges. Research was focused in four areas--safety, renewal, reliability, and capacity. The program carried out 145 research projects and produced 130 products as well as 132 research reports. The Responder Safety Learning Network delivers free training modules and downloadable resources in the safety aspects of traffic incident response. These modules and resources are vetted by recognized experts, consistent with the NUG, and in alignment with any associated standards and requirements that apply to an individual module or resource topic. The testing and documentation available for module completion assists emergency responders in keeping a training record that can assist with meeting continuing education requirements.